Bard Complete Care Add-A-Foley Drainage Bag Tray features an infection control drainage bag and includes the Uro-Prep tray which contains all the material necessary for aseptic catheter. It also features the Ez-Lok sampling port which eliminates the risk of needlestick injuries and allows for needle-free aspiration. Add-A-Foley Drainage Bag Tray complements the Bardex I.C. and Lubri-Sil I.C. foley catheters with Bacti-Guard silver alloy coating. Federal (U.S.A.) law restricts this device to sale by or on the order of a physician. Do not aspirate urine through drainage funnel wall. Some Foley catheters may contain Natural Rubber Latex which may cause allergic reactions. Please check the package. Contains or Presence of Phthalates: Di(2-ethylhexyl)phthalate (DEHP) is a plasticizer used in some polyvinyl chloride medical devices. DEHP has been shown to produce a range of adverse effects in experimental animals, notably liver toxicity, and testicular atrophy. Although the toxic and carcinogenic effects of DEHP have been well established in experimental animals, the ability of this compound to produce adverse effects in humans is controversial. There is no evidence that neonates, infants, pregnant and breastfeeding women exposed to DEHP experience any related adverse effects. However, a lack of evidence of causation between DEHP-PVC and any disease or adverse effect does not mean that there are no risks. With Temperature-Sensing Probes, in the presence of RF energy sources, local heating, temperature errors, and probe damage may occur. In medical use, unplug the temperature-sensing catheter at the temperature monitor before activating electrosurgical or other types of direct coupled RF energy sources. Do Not Stretch Catheter. This will cause repositioning of the probe. Do not use Stylet. This will cause stretching of the catheter. On catheter, do not use ointments or lubricants having a petrolatum base. They will damage latex and may cause the balloon to burst. Visually inspect the product for any imperfections or surface deterioration prior to use. Use Luer tip syringe to inflate with stated ml of sterile water OR for pre-filled products, remove clip and squeeze reservoir to inflate with stated ml of sterile water. 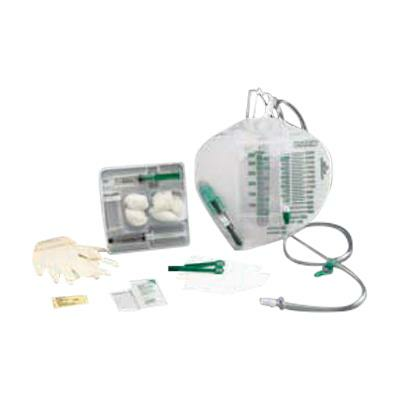 Store catheters at room temperature away from direct exposure to light, preferably in the original box. This is a single use device. Do not resterilize any portion of this device. Reuse and/or repackaging may create a risk of patient or user infection, compromise the structural integrity and/or essential material and design characteristics of the device, which may lead to device failure, and/or lead to injury, illness or death of patient. Aggressive traction, particularly in the presence of suturing is not recommended for 100% silicone catheters. Should balloon rupture occur, care should be taken to assure that all balloon fragments have been removed from the patient. Do not exceed recommended balloon capacities. Sterile unless package is opened or damaged. Catheters should be replaced in accordance with the CDC guideline, "Guideline for Prevention of Catheter-Associated Urinary Tract Infection." At the onset or first signs of a urinary tract infection, catheter encrustation, or any other catheter-related adverse effect, the catheter should be replaced.